Battle of Fort Donelson--Capture of General S.B. Buckner and his army. Kurz & Allison, Art Publishers . Lithograph, hand colored. "No terms except an unconditional and immediate surrender can be accepted." After capturing Fort Henry on February 6, 1862, Brig. 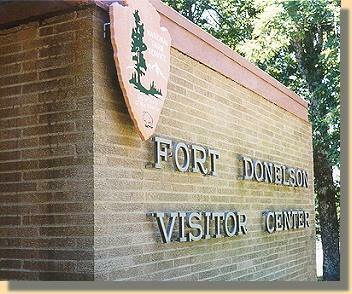 Gen. Ulysses S. Grant advanced cross-country to invest Fort Donelson. In the afternoon of February 14, Andrew H. Foote's Union gunboat fleet, consisting of the ironclads St. Louis, Pittsburgh, Louisville, and Corondolet, and the timberclads Conestoga and Tyler, arrived from Fort Henry via the Tennessee and Ohio rivers and exchanged fire with the guns of the Southern water batteries . During the battle Foote was wounded and, due to extensive damage, the gunboats were forced to retreat. 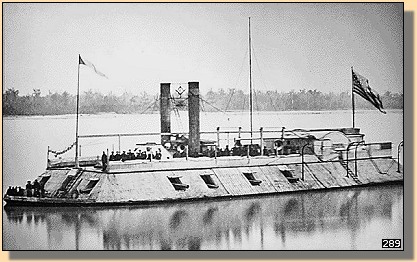 First ironclad gunboat built in America. The Saint Louis, ca. 1862. Despite this victory, the Confederate generals (John Floyd, Gideon Pillow, Simon Buckner, and Bushrod Johnson) knew that Grant was extending his right flank , threatening to completely encircle the Southerners. If the Confederates did not move quickly, they could be starved into submission. Accordingly, in an effort to clear a route to Nashville, they massed their troops for an attack against the Union right. The battle, in the morning of February 15, saw the Union army being pushed back by the Confederates. However, due to confusion among the Confederate commanders, the Southern troops were ordered to return to their entrenchments. Grant immediately launched a counterattack which regained the ground lost and insured that the Confederate army would be blocked from escape. Early the next morning, February 16, Generals Floyd and Pillow turned over command of the Fort to General Buckner and escaped with about 2,000 men. Cavalryman Colonel Nathan Bedford Forrest and some men also escaped, by crossing the swollen Lick Creek. That morning Buckner asked Grant for surrender terms and received Grant's famous "Unconditional Surrender" message (See above). The surrender negotiations were held in the Dover Hotel. The walls of Fort Donelson, a typical earthern fortification , were formed in an irregular circle which enclosed about 15 acres. Confederate soldiers and slaves built the walls by piling dirt over an inner-structure of trees which had been cut down in the area. The fort itself never came under direct land attack, and Union infantry had penetrated only halfway beyond the outer defenses when the Confederates surrendered. Confederate lines are in red and the N.P.S. tour route is in blue .